Where is Mr. Bruce? Can you spot him is the picture to the left? 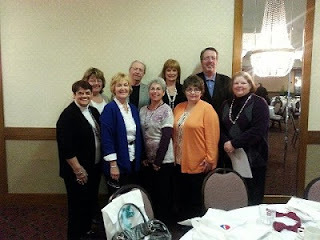 The annual Missouri Hospital Association convention was held again this year a Tan-Tar-A Resort in Osage Beach, MO. He always enjoys attending these meeting; he is one of 9 people representing the CoxHealth Auxiliary this year. I would like to take a moment to thank Margie Beadles personally for all of her outstanding service to the CoxHealth Auxiliary. Margie has worn many hats for the auxiliary, not least was being President of Missouri Auxiliary Hospital Association 2011-2012. (Whew, I hope I have that title correct. Margie is a retired school principal and I sure don't want a bad grade.) As president she chose “You Ought To Be In Pictures - Get Screened NOW” as the statewide cause. Please click here, then scroll down the page to read more about this. Also check the section below where all the various ribbons are, each one representing a different type of cancer. Jeanne Robertson was kind enough to do a show in Springfield to help raise funds for the very good cause. Check the stories on Jeanne Fun to read more about this fun event. Of course, Margie is special to Mr. Bruce and me for another reason; she talked Mr. Bruce into serving as pres. elect and now the auxiliary president. All of the volunteers have been supportive and helpful as he learned the ropes. Actually, he is very excited about the next two years. Oh, I must not forget to invite y'all to be a volunteer at CoxHealth. Don't live in Springfield, MO? No, problem...there are volunteer opportunities in every community including online.